The soft cat pad is a soft orthopedic pad that provides the same comfortable warmth as the hard cat pad. This pad is the prime choice for older cats with orthopedic issues. It only heats when your cat lies on the soft bed and will only heat under the cat. 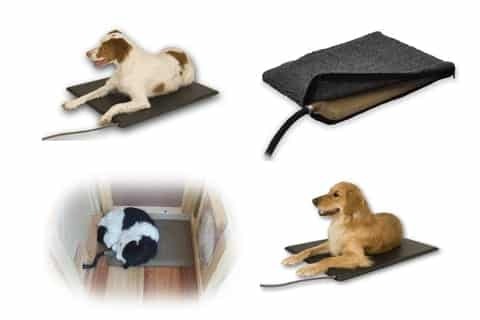 Blythe Wood Works is a factory direct distributor of heated pet pads. A heated pet pad is absolutely the safest, most reliable and energy efficient method to provide your pet with a comfortable warm environment during the coldest of winters. Depending on the pad size, the electricity needed to operate the pad is the same as one light bulb (15 to 80 watts). We recommend that the heated pet pads not be more than half the floor size of the cat or dog house so that the pet can either get off completely or partially as he chooses. The internal thermostat keeps the temperature at a desireable 102 degrees when in use. The Dog and Cat Pad – indoor or outdoor – a small 9×12 inch pad that beautifully fits in our 17″ and 20″ cat and dog house. It is a hard ABS Plastic pad so as to resist claws and chewing. The first 18 inches of the power cord are steel wrapped for added protection. The 9×12 pad comes with a soft weave pad cover that allows the warmth to easily radiate through to your cat. The pad cover is removable and washable. When you purchase a heated pad with a dog or cat house, Blythe Wood Works will prep the house for the electric cord with a bug and moisture resistant hole plug at no charge. Catillac 14" x 18", Cool Cat Cottage (1-2 Cats) 14" x 18", Medium 14" x 18", Medium Duplex 14" x 18", Large 19" x 24", Large Duplex 19" x 24", Cool Cat Cottage (3 or more Cats) 19" x 24", Extra Large 25" x 36", Giant 25" x 36", Godzilla 25" x 36", Goliath 25" x 36"